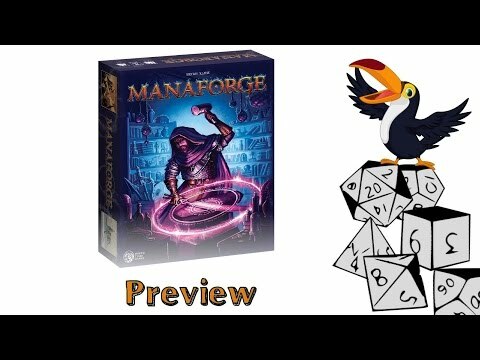 Manaforge is a dice-rolling resource management game of crafting magical equipment for 2 to 4 players. Each player plays a wizard that specializes in creating magic items. These wizards cater to rich adventurers looking to trade their hard-won spoils for magical gear to make themselves more powerful. Each wizard owns a magic shop in which they display the fruits of their labor for gold-laden adventurers to come in and purchase. However, the adventurers' funds are finite. The wizards are competing to make their shops the most famous so that the adventurers will stop there first. And the best way to make a shop famous is to have the most impressive selection of useful and powerful magical gear. Whichever player's store obtains the most Prestige (victory points) will attract the customers and make the sales. May the craftiest wizard win! 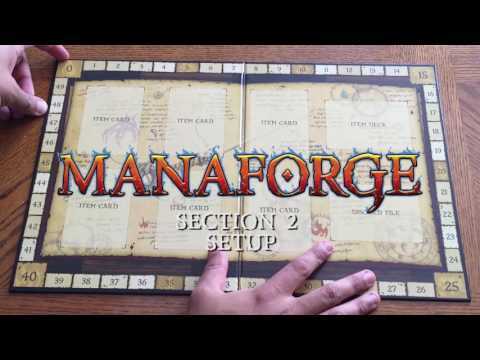 Manaforge is played over nine rounds. At the beginning of each round, six cards representing the items that can be created that round are placed on the center board. Each player rolls their own handful of dice, the symbols on which represent the types of mana that they have to spend this round. Then in player order, each player spends that mana to construct one of the items in the center, taking its card and adding it to their collection. Some cards have an instantaneous effect and are then discarded, while other cards stay in play and grant the player benefits such as additional mana each turn or the ability to turn mana into Prestige. Beware, though: time is short! Each player may create only one item each round, so a player can only ever get nine cards in total.